The history of today's solid wood flooring. What’s the history of solid wood flooring? What’s the solid flooring today? This day in age, hardwood is considered to be one of the most popular flooring options. With so many species to choose from, there is a hardwood floor that can complement just about living space. But at what point did hardwood flooring first make its appearance in the pages of history? From known historical records, it wasn’t until the Middle Ages that hardwood began to show up as a flooring material. This type of flooring required visitors to wipe their shoes on a mat before entering the home in order to prevent the earth from getting muddy and depending on the weather. Once North and South America was discovered, along with its seemingly endless supply of old growth forests, the use of wood for flooring became commonplace among the settlers living throughout the colonies. It was in such great abundance that using any other material for common housing was simply impractical. Hardwood floors at that time were mainly built using slow growth pine. Due to the immense size of slow growth trees, it was possible to produce very large sawn planks. They were not sanded or finished like what we find today, they were simply polished smooth by the feet of generations of colonists. By (1625-1714) wooden floors began to take on a more elegant fare, introducing French Parquetry and Marquetry flooring pattern. Intricate designs were cut by hand and laid with contrasting colored species of wood. Regardless of the pattern in which they were laid, these floors were typically hand scraped, scrubbed with sand, stained and polished. This style of flooring required skilled craftsman and painstaking hard labor. These types of hardwood floors were only found in the homes of Royalty and most affluent of the time. It wasn’t uncommon for lower classes to attempt imitating these floors by painting flooring planks with various designs. In the early 19th century more and more Parquet patterns began to emerge, yet still only in the richest of homes. There were many types of patterns for the panels that make up a luxury wood parquet floor. Eventually, the industrial age brought machinery for the finer milling of lumber. The development of steam and electric power during this period led to growth in the need for better housing and subsequent demand for even more wood flooring material. Oak quickly became the species of choice due to availability, cost, easy machining, strength, and beauty. With the expanding demand and vast increase in world commerce, the use of different domestic hardwoods, as well as exotic imported species, began to quickly evolve. The hardwood flooring industry resembling the one we know today began just before the turn of the 20th century. In 1885, the side-matcher was developed. Creating flooring with a tongue on one long side and a groove on the other. This allowed wood floors to be blind-nailed, which provided a more elegant look free from visible nail holes. The technology quickly progressed, bringing better and better milling options and providing easier installation. Then the central heating system was introduced and began wreaking havoc with hardwood floors. What are the differences between solid and engineered hardwood? Which is better? As the name implies, planks of solid hardwood are solid pieces of wood. Solid wood can be used in any room that is above ground. Engineered hardwoods are still made from real wood, but the planks are created by layering wood veneers. The layers under the top may or may not be the same type of wood as the wood that’s visible from the top. As with other home finishing choices, there are advantages and disadvantages to both. Stability: This type of veneer construction is more dimensionally stable than solid wood floors. Because each layer of wood is glued to the next layer at a 90-degree angle, expansion and contraction are greatly reduced. Wood expands and contracts primarily in the width; therefore, gluing the veneers together in this manner reduces the effects of expansion and contraction. This also minimizes the effect of the flooring gapping or cupping as the indoor environment changes from season to season. Installation versatility: There are engineered wood floors that can be installed via nail or staple, gluing directly onto the subfloor or floating. Engineered floors also are appropriate for below-grade installation. Cost: Engineered flooring can be less expensive than solid flooring. Many of these products are constructed of several thin veneers of wood glued tone another, which allows for a much better yield of the raw materials. Thus, the cost of raw materials is less than that of solid products. The lower layers of the product can be less than perfect, as they will not be seen by the consumer once the floor is installed. Grain pattern: Many engineered products have a top layer that is peeled from the log. Because solid boards are sawn wear layers, a solid sawn top layer adds durability to the flooring. Traditional Flooring: A solid hardwood floor can add real value to your property, both in terms of its aesthetic effect and market value. If you are looking for traditional flooring, there is no better option than solid hardwood; people have been using it for hundreds of years. 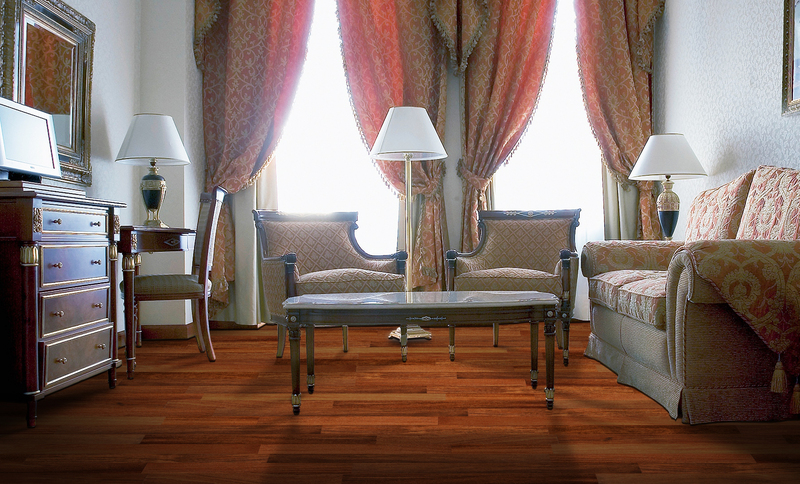 Solid Hardwood flooring has stood the test of time. It properly cared for, nothing beats its longevity. So which one is better? It’s really your preference.